Abandoned in the 1960s, the holy shrine of Brag dkar rta so in south-western Tibet was gradually revived in the late 1980s. 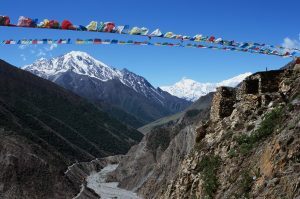 Linked to the great Tibetan mystic Mi la ras pa (c. 1052 – c. 1135 CE) as well as lHa btsun rin chen rnam rgyal, Rig ‘dzin tshe dbang nor bu and Brag dkar chos kyi dbang phyug, this site was famous as a pilgrimage destination, a monastery and an early printing house. As such it appears in many historical accounts and its revival has had a huge symbolic signficance. After outlining Brag dkar rta so’s importance as a Buddhist monastery in the Tibet-Nepal borderlands, I will focus on the current process of restoration. Setting out from the accounts of people involved in its revival, I will look at this particular case as an opportunity to explore the current management of Tibetan cultural heritage.